L.D. Lewis is the author of Dancing Star Press’s first novella, A Ruin of Shadows. 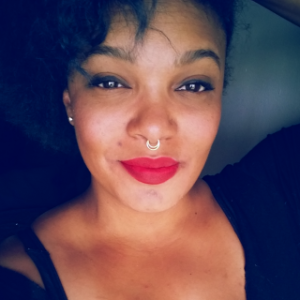 She is also the Art Director for FIYAH Literary Magazine for Black Speculative Fiction, where her short story “Chesirah” appeared in its inaugural issue. Both stories take place in her Three Known Worlds universe, along with some novels that are still forthcoming. Check out her author page and follow her @ellethevillain. You’ve said in an interview at Black Nerd Problems that half of the stories you’ve written have been song-inspired. You’ve also hinted that there is a playlist for A Ruin of Shadows. Was there a particular song that inspired this story? And what can you tell me about this playlist? ​Yes, while about half of my stories are song-inspired, almost all of them end up with a playlist eventually. I have chromesthesia, which is the reception of sound as color. So a lot of times, music helps me set tone and setting as much visually as otherwise. In some cases, like with A Ruin of Shadows, I’m directly inspired by lyrics. Lupe Fiasco’s “Hello/Goodbye [Uncool]” is sort of a hyper-dramatic anime fight scene in my head, which fed my visualization of Edo’s fight to get out of Citadela and survive the night. I first knew I had to write a story about the line “He stands to find himself surrounded / by thousands of soldiers that he once trained / to never miss their targets, heartless.” And at the time, I was fleshing out the relevant histories of my Three Known Worlds universe, so that line became how one empire fell to give rise to another one you’ll hopefully see soon. ​It depends. ​It’s usually just rain sounds unless I have a playlist or I’m having trouble crafting a scene. Then I’ll find something that helps me hash it out. ​Favorite scene… I won’t spoil, but it’s probably when Edo ​has Negus to herself. I like the visualization of that room, his cowering surrounded by comfort and opulence. It’s a place Daynja deserves even though she’d never admit an interest in it. I like her calm patience in a situation where a lesser person might have otherwise been tense. It’s the first “mission” she’s assigned herself and it’s one she’s so certain about. Your stories have a rich feel, like you are drawing from a wide variety of inspiration. What authors and books have had significant influence on you? What are some of the movies and video games that have influenced you? As far as movies, I don’t know that I can point to any specific one directly. It’s an amalgamation of movies usually that explore adjacent worlds somehow connected to ours. So, Mamoru Hosoda’s The Boy and the Beast, Miyazaki’s Spirited Away, Guillermo Del Toro’s Pan’s Labyrinth. James and the Giant Peach (hey, there’s a book for you!). What is your research process like when you are world-building for a new story? I don’t know that I have a research process. ​It’s mostly just jotting down interesting things from nature documentaries and random Googlings of questions I have in the middle of the night. I have a few Moleskines full of this stuff. I also watch an almost disturbing amount of Anthony Bourdain’s Parts Unknown. I come for the food and stay for his hosts’ stories about their homes and their cultures and how they influence said food. This inevitably leads to more researching and Pinterest recipe searches. ​Some of it makes it into my stories. I think most of it just kind of sits, though, and manifests in other ways. ​It definitely doesn’t energize me. Writing’s a bit like bloodletting, isn’t it? Or at least what bloodletting was supposed to do. You’re gradually putting more and more of yourself on the page ​and it’s draining until it isn’t. You inevitably get to that light feeling, that punchy sort of euphoria that feels like energy, but indicates you should probably hydrate and maybe have a cookie and chill out for a while. Finishing a story is pretty great, though. From your twitter account it seems like you have endless writing projects going. How many stories do you typically have on deck at any one time? ​I usually keep three projects going at a time, all of them in different phases of development. When I get frustrated with one​, I can bounce to another. I think it makes me slower at completing things, but occasionally I’ll finish three things around the same time. So that’s cool. How did you first get into the fantasy genre? For its first year of existence as a literary magazine, FIYAH has had an impressive number of stories nominated for major awards. Is there anything you are particularly proud of accomplishing during your time at FIYAH? I’m Art Director, so I have to shout out my artists! I’m immensely proud of Geneva Benton‘s work in our first year. She’s incredibly talented and has thus far been nominated for a British Science Fiction Association Award for Issue 3. I have my fingers crossed for the Hugos as well. She deserves it. This year I’m thrilled to work with four incredible new artists and to expose our readership (and those who just like looking at our covers) to their styles. And I’m excited to see their accolades and opportunities manifest in things that keep them paid and capable of continuing the work they love. ​I’m also really proud of all our debut writers. I’m not involved with story selection, but I format all the issues so I’m responsible for making sure these stories get to where people can experience them. I love being able to put names I don’t recognize on the covers. Every new story is potentially someone’s new favorite writer. I like to think they’d have submitted to other markets if we didn’t exist, and that they’d have eventually made it past those barriers and been revealed to us another way. But I also know FIYAH was the first place some of our writers felt like they and their work had a support system when they came to us. Now we’re somebody’s first byline. You never know where someone’s career is going but we had the privilege of being their first step. A Ruin of Shadows will be released April 24th! You can pre-order it here. Pick up “Chesirah” and a bunch of other great stories in FIYAH’s first issue, and be sure to check out their other issues while you’re at it. And you really might as well pick up a subscription so you don’t miss anything in the future.